the table for that next barbecue. BOAST that you'll be putting a French red on the table at that next barbecue, and when guests lap it up with the steaks, chops and sausages 'fess-up that French as it is, it cost you just $10.99 a bottle. 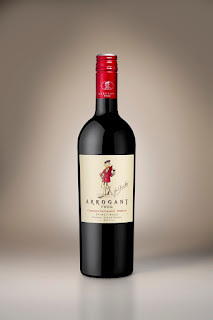 The quirkily-named Arrogant Frog Ribet Red is a 55% Cabernet Sauvignon and 45% Merlot blend from the Languedoc region in the south of France, and has nice cherry, raspberry and strawberry compote characters, supported by ripe cassis, plum and herbs coupled with chocolatey tannins. And as interesting is the wine itself and its unusual label, equally so is its maker Jean-Claude Mas – a native of Languedoc, he worked in the sports car business in Paris, Miami and Bordeaux, became a race-car driver, but succumbed to his passion for wine and gave up fast cars for winemaking. The Arrogant Frog label now sells some 10-million bottles annually world-wide, and is available here through Woolworths Liquor, Dan Murphy's and BWS. ONE FOR LUNCH: With Spring just around the corner a wine to look out for for that first picnic of the season, maybe brunch on the balcony in the sun or late afternoon canapés as night falls, is increasingly-popular Moscato. Campbells in Victoria's Rutherglen have released a delightfully easy-drinking 2012 Moscato that you won't have to think twice about indulging a few glasses – its just 7% alcohol which is around half the norm.